Incredible collection of circa 1944 & 1945 U. 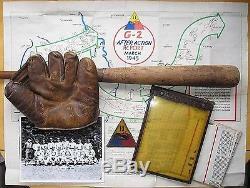 Army 11th Armored Division "Thunderbolts" baseball glove, bat and team photo PLUS two WW2 used maps, a map case and uniform patch. A collection of 7 original WW2 items. 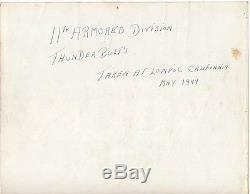 Original 8x10 baseball team photo of the 1944 11th Armored Division Lompoc Thunderbolts. New York Yankees pitcher Steve Peek is on the team (the tall guy in the center of the back row). 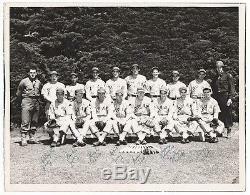 The photo was taken in May 1944 and has each players last name with their home state written above and below each player. The names written above the players on the top row are difficult to see because of the dark background so I enlarged that portion of the photo to make it easier to see. Also has the particulars written on the back (see photo). Army Rawlings Bill Doak model baseball glove. The web looks to have been re-laced at some point. Army Hillerich & Bradsby Jimmie Foxx model baseball bat. The handle has a crack, the handle was taped, the knob is chipped and there are a few dings and marks on the barrel. 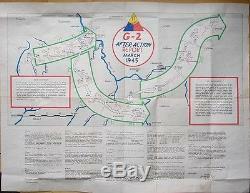 March 1945 11th Armored Division After Action Report map, measures 22 x 29 inches with original folds. 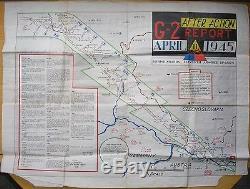 April 1945 11th Armored Division After Action Report map, measures 22 x 29 inches with original folds. Has tears along bottom border. Has "Miscellaneous Extracts" on the back. Original WW2 well used flexible celluloid plastic and leather map case. The clear plastic has yellowed and is cracked and taped in several places on one side. The plastic has the graph-hash marks. Measures 7.5 x 10 inches. 11th Armored Division Thunderbolts triangle well used uniform patch. The item "Vintage 1944-45 US Army WW2 Baseball Glove, Bat, Team Photo, Maps Etc Collection" is in sale since Friday, February 24, 2017. This item is in the category "Sports Mem, Cards & Fan Shop\Vintage Sports Memorabilia\Gloves-Baseball". The seller is "sports-artifacts" and is located in Carmel Valley, California. This item can be shipped to United States, to Canada, to United Kingdom, DK, RO, SK, BG, CZ, FI, HU, LV, LT, MT, EE, to Australia, GR, PT, CY, SI, to Japan, to China, SE, KR, ID, to Taiwan, ZA, TH, to Belgium, to France, to Hong Kong, to Ireland, to Netherlands, PL, to Spain, to Italy, to Germany, to Austria, RU, IL, to Mexico, to New Zealand, PH, SG, to Switzerland, NO, SA, UA, AE, QA, KW, BH, HR, MY, BR, CL, CO, CR, PA, TT, GT, HN, JM, AG, AW, BZ, DM, GD, KN, LC, MS, TC, BB, BD, BM, BN, BO, EC, EG, GF, GG, GI, GP, IS, JE, JO, KH, KY, LI, LK, LU, MC, MO, MQ, MV, NI, OM, PE, PK, PY, RE.